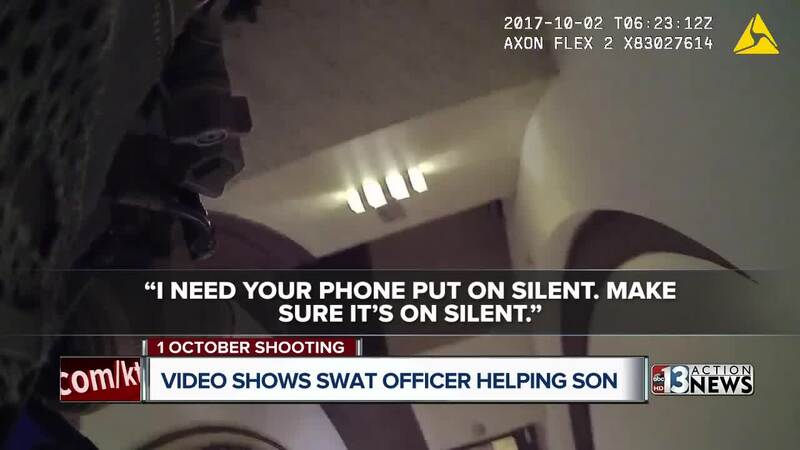 New body camera video released from the Las Vegas mass shooting investigation revealed an emotional phone call between a SWAT officer and his son. "Listen to me. I need you to stay super calm," SWAT officer Billy Marx said to his son, Parker. Marx's body camera was rolling as he was responding to the deadliest mass shooting in modern American history. Parker was attending the Route 91 Harvest Festival and was grazed with a bullet. After he escaped the festival grounds, the 19-year-old called his father. Marx helped guide his son to safety. "I swear to God, I'm going to get you," Marx said. "I need you to not make any noise, turn your phone on silent." Parker's girlfriend was shot on that night. He made sure she was safe and got treatment. "The words that he said were, man up," Parker said after watching the footage for the first time. "...that really calmed me down." Video also shows Marx going to the 32nd floor of Mandalay Bay, where shooter Stephen Paddock was firing on the thousands of people who attended the festival on the Las Vegas Strip. Parker said he's always been inspired by his father. After the shooting, he decided to follow in his dad's footsteps. "This is what I need to do," Parker said. "I want to serve my community." He plans on applying for the force this fall. 58 people died and hundreds of people were wounded during the mass shooting. Las Vegas police were ordered by the Nevada Supreme Court to release all documents and video and audio files related to the investigation after being sued by various media outlets. The department releases a batch of material every Wednesday.